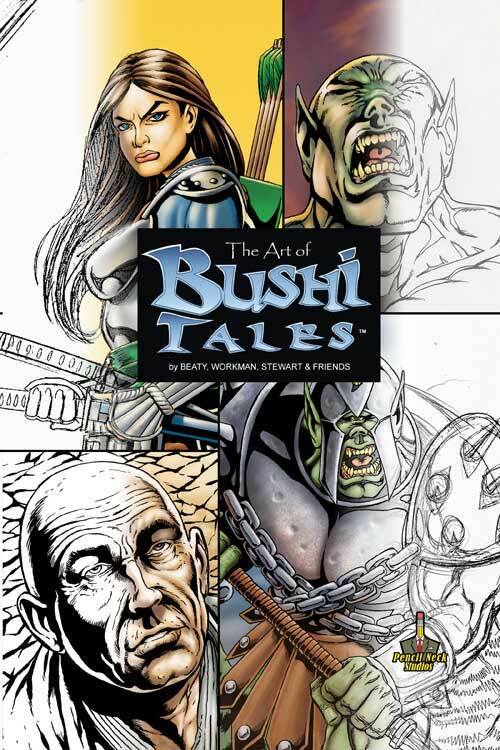 The new Art Of Bushi Tales book is now available! Dave Beaty, Lin Workman, and Micah Stewart take you behind the scenes in the Art of Bushi Tales. See the scripted page come alive from pencil sketches to painted art. Includes a special guest artist gallery featuring art by Bret Blevins, Scott Clark, Greg Cravens, Andrew Charipar, Harold Jennett, Martheus Antone Wade, and more! A must have for art lovers and Bushi Tales fans. It’s is the 31st century of man and the ancient world has returned. Four female Samurai are sent on a quest by Hachiman, the god of war, in this post-apocalyptic series created by Dave Beaty (X-men: Sword of the Braddocks, Adventure Comics, Brightest Day) and Lin Workman (Stargodz, Scared Silly, CGS: The End). The book is available from Indy Planet. If you’d like to have one personalized or pick up a copy in person Dave, Micah and I will all be at the Phoenix Comicon (Cactuscon) this May, so if you’re in the area stop by the Bushi Tales booth and say hi. I should have news on the Bushi Tales trade paperback coming soon- stay “tooned”!